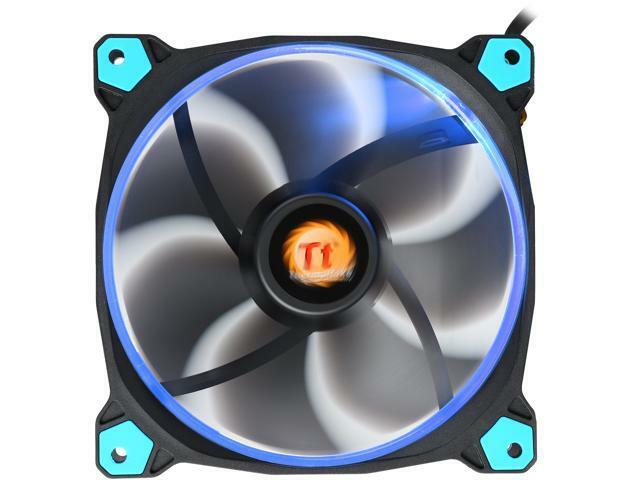 Great for use as a case fan or radiator fan, the Thermaltake Riing 14 fan delivers enhanced static pressure with an optimized fan blade design. Its hydraulic bearing is quiet, and guarantees prolonged lifespan. The anti-vibration mounting system strengthens stability during operation, reducing noise and the risk of HDD performance degeneration caused by vibration. 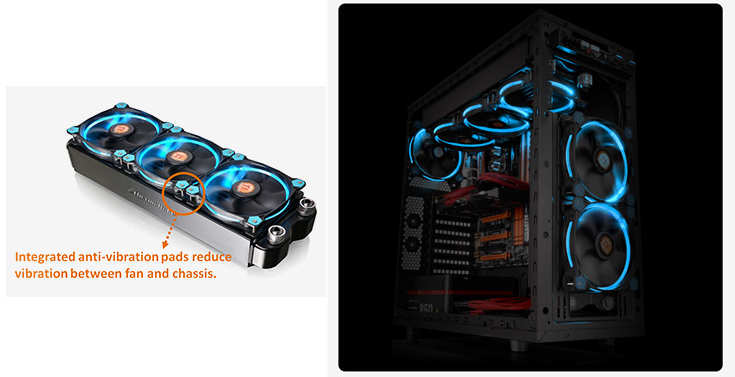 Beyond the robust cooling performance, this case fan comes with Thermaltake exclusive LED Ring design that maintains color and brightness uniformity, resulting in consistently beautiful lighting effect from all sides and angles. *The bigger number of ?T means the better performance. Pros: Relatively quiet, rubber corners isolate vibration pretty well. LED ring is very well balanced, visually. The fan blades are obviously opaque black, so only the ring lights up, and it gives enough to cast a good glow on the case interior without being a signaling light for incoming alien space craft passing by Mars. Moves plenty of air. Using both the 120mm and 140mm version for different spots in the case and they both work great. Cons: Three pin connector, which isn't an issue except that the Molex to fan connector included with the fan is only for three pin fans. This means you can't rig a 4 pin fan to just run wide open throttle off that connector. Just slightly less use out of the included hardware, but you probably aren't buying this for the Molex to fan connector that's included. Other Thoughts: The "LNC" Low Noise Cable that's included in this and all other Riing series fans is kind of a joke. It is basically just a resistor in line with the fan to trick the mobo into running it slower. 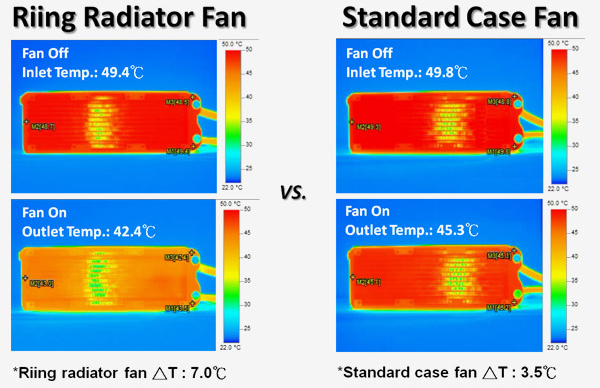 This allows you to run the fan at lower % of speed than normally able. It's a neat theory, but these fans are already pretty quiet at 50%, so I'm not sure how necessary this is, and you probably won't gain much out of it. 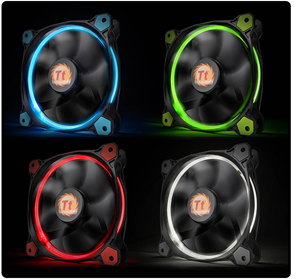 Other Thoughts: I HIGHLY recommend these fans to anybody looking to try these fans out! Pros: Does what it's supposed to do. Blue LED looks good in a dark room. 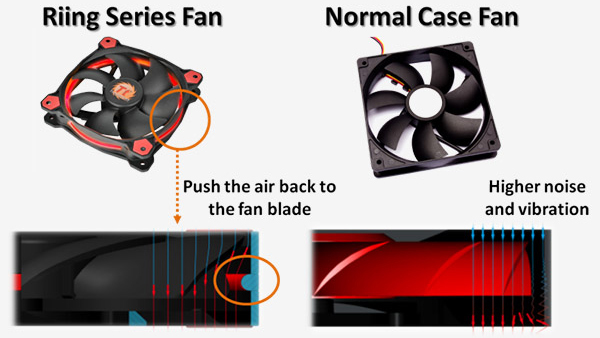 Pros: Quality is number one in a fan and this fan is perfect. The mounting area has rubber so the fan housing is isolated from case frame. The stock picture does not do it justice. 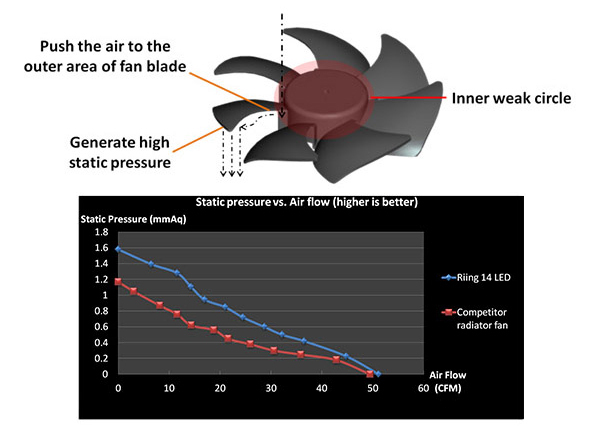 Nice looking fan in operation. 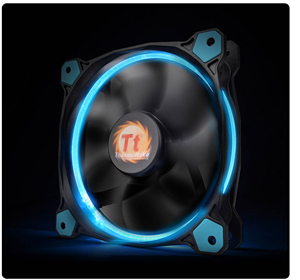 Other Thoughts: Wish I could post pictures on Newegg's web site reviews to show how wonderful this fan looks in real life.